Info "Get outta this place before its blown to smithereens!" Rock It! is Wario-Man's microgame in WarioWare: Twisted! 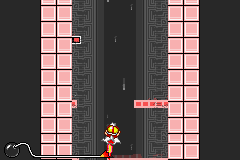 The player must tilt the Game Boy Advance to guide Wario and the rocket through the highway to the exit. If the rocket bumps into a bar, the player loses. Level 1: There are three bars. Level 2: There are four bars. Level 3: Bars pop out of the walls. This page was last edited on November 17, 2018, at 03:17.